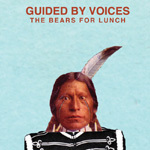 This is the reunited Guided By Voices' third album of 2012, in case you had lost count. Many bands struggle to release three albums in their career, never mind three in one year. It would be one thing if these were tossed off lo-fi affairs of the sort one might expect from the fellows who made the defining records of that so-called genre, Bee Thousand (1994) and Alien Lanes (1995). While the debut from the reunited "classic" line-up, Let's Go Eat The Factory, contained it's share of basement gems, both that record and its follow-up Class Clown Spots A UFO are notable more for the preponderance of properly recorded rock, a testament to the years bandleader Robert Pollard has spent refining both his songwriting and his approach to recording. The Bears For Lunch is not a great deal different in that regard, but right off, from the opening track "King Arthur the Red," with its full-throated riffery, slam-tastic drums, and even some show-offy lead guitar shredding, it's evident that GBV Mach 2 may just now be hitting its stride. The progression is not dissimilar to the one the band made from Alien Lanes to its 1996 high-water mark Under The Bushes, Under The Stars, both in terms of longer, more fleshed-out songs and let's call it a semi-pro approach to recording fidelity. For all the well-deserved acclaim the first two records this year have garnered, Bears is a step up in every sense. This isn't to say there's a whole lotta gloss going on, and certainly the album has its share of more casually considered songs, but from the relentless drum figure that fuels sure-fire-live-staple and obvious single "Hangover Child" ("the best thing Kevin 's ever played" sez Pollard) to the chugging, melancholic, melody-mad "White Flag" ("I think you know this time it's real," sings Bob over an almost New Order-ish bass line) to the propulsive, early-R.E.M.-inflected album closer "Everywhere Is Miles From Everywhere," the 19-song 43-ish minute long Bears delivers a gut-punch as sure and assured anything the band's ever dished out. And that's without mentioning the stellar contributions of Tobin Sprout ("The Corners Are Glowing" and "Waving At Airplanes" are particular standouts), bouts of unrestrained whimsy like "The Military School Dance Dismissal," featuring what sounds like seven tracks of Pollard singing in unison/harmony over a Beatle-esque piano line, or the staggering work of heart-breaking genius "You Can Fly Anything Right." Add to this Pollard's two excellent 2012 solo albums, a raft of festival appearances and some club touring, and you have possibly the most consistently productive output in one year ever from a band and a songwriter already noted for its/his insanely prolific nature. That said, in a year of highlights, The Bears For Lunch may well take the most cake. 3rd album recorded by the reunited classic lineup that may be out in November, 2012. Original potential release date was Oct. 2012, but I assume it got bumped by a month due to Let's Go Eat The Factory's success like the other 2012 releases did. One song from this album, "Hangover Child" was played at the Nelsonville, OH show on 5/18/2012.